Yet another exclusive color release from Playstation Portable, only available in Japan. Mint Green, in time for St. Patty's Day! Order via Amazon Japan through Rinkya Stores! Mega Muffin From McDonald's Japan! Go Green With Reusable Chopsticks! Dress As A Ninja & Get A Free Train Ride! A Booby Prize you Want! Searching for that SuperModel Body? Do You Like To Read About Japan? Louis Vuitton Monogrammed Roses for White Day! Disney Releases Japan Lilo & Stitch Show! 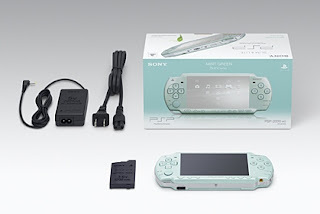 Another New Sony PSP Color!